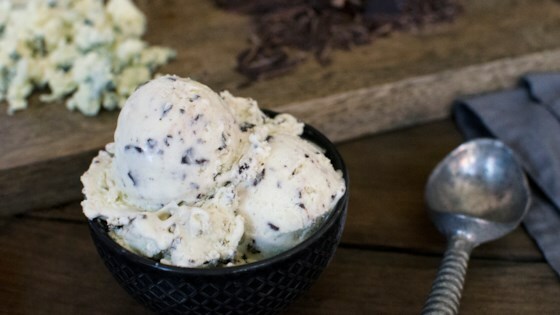 "Tangy melted blue cheese, hints of lemon, and chunks of dark chocolate are swirled together to make the best ice cream you never knew you wanted. Photo and recipe courtesy of A Side of Sweet." Place the blue cheese, lemon juice, sugar, and salt in a large bowl. Bring the heavy cream to a boil in a medium saucepan, stirring occasionally. Pour the heavy cream over the blue cheese mixture and stir until melted and combined. Chill the mixture in the fridge, at least 30 minutes. Once chilled, pour into an ice cream maker and freeze according to manufacturer's directions, about 20 minutes. Stir in the dark chocolate chunks and freeze until firm, about 4 hours.